Branched broomrape has been in Australia for a number of years, and has been subject to extensive attempts to eradicate it. 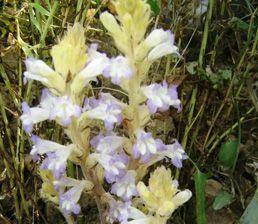 A national agreement was reached that branched broomrape could not be eradicated. Instead, a transition program was established to manage the parasitic weed. PHA was involved in the Branched Broomrape Transition to Management plan due to its growing experience with handling similar programs for Asian honey bees and myrtle rust. A two-year transition program aimed at managing the weed in South Australia’s Mallee region began on 1 July 2012. Development of the branched broomrape plan was led by representatives from South Australia and informed by extensive consultation with affected producers in the area where the weed is found, affected industries, all state and territory governments and the Australian Government. 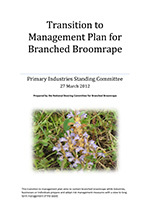 The plan intended to represent a collective position on the future management of branched broomrape. The goal of the transition program was to contain the weed while industries, businesses or individuals prepared for and adopted risk management measures with the aim of long-term management. Biosecurity SA maintained restrictions on the movement of high risk products and machinery during the two year transition, but lower risk products were able to move freely. Restrictions applied only to high risk commodities on the properties known to be infested with branched broomrape at the time. These properties remained in quarantine under a Ministerial notice issued under the South Australian Plant Health Act 2009. Other properties that were under quarantine but not infested (or where broomrape had not been detected through surveys for 12 years) were released from quarantine on 1 July 2012. Surveys of crops in paddocks still under quarantine will be carried out to support affected landholders with accreditation of products to provide market confidence during the 2012-13 financial year. Research has shown that branched broomrape can be managed through on-farm biosecurity practices.